New University of Toronto research has found that the rocky object that puzzled scientists by barrelling through our solar system seemingly out of nowhere very likely came from a binary star system. “It’s remarkable that we’ve now seen for the first time a physical object from outside our solar system,” says the study's lead author Alan Jackson, a postdoctoral researcher at the Centre for Planetary Sciences at U of T Scarborough. The study has garnered international headlines. The object, called ’Oumuamua which means “scout” in Hawaiian, was discovered by the Haleakala Observatory in Hawaii on Oct. 19. With a radius of 200 metres and travelling at a blistering speed of 30 kilometres per second, the closest approach it made to Earth was about 33 million kilometres. At first researchers assumed it must be a comet, one of countless icy objects that release gas when it warms up as it approaches the sun. But it didn’t show any comet-like activity as it neared the sun, and was quickly reclassified as an asteroid, meaning it was rocky. They found that rocky objects like ’Oumuamua are far more likely to come from binary than single star systems. They were also able to determine that rocky objects are ejected from binary systems in comparable numbers to icy objects. “It’s really odd that the first object we would see from outside our system would be an asteroid because a comet would be a lot easier to spot,” says Jackson, who specializes in planet and solar system formation. Once they determined that binary systems are very efficient at ejecting rocky objects, and that a sufficient number of them exist, they were satisfied that ’Oumuamua very likely came from a binary system. They also concluded that it likely came from a system with a relatively hot, high mass star since such a system would have a greater number of rocky objects closer in. A binary star system, unlike our own solar system, has two stars orbiting a common centre. The researchers suggest that ’Oumuamua was very likely ejected from a binary system sometime during planet formation. Researchers were also pretty sure it was from outside our solar system based on its trajectory and high speed. The research, which began this past October and was published in the Monthly Notices of the Royal Astronomical Society, was an intensive project for Jackson and his co-authors. The fact that ’Oumuamua was classified as an asteroid piqued his curiosity, and the driving motivation was figuring out the big unanswered question of where it came from. As a starting point, Jackson says it’s important to understand that in order for an object to be ejected from a star system it needs to interact with something big. In single star systems like our own, comets make up the vast majority of objects that are ejected because they form farther away and are less bound by the gravity of the sun. “Comets can be thrown out of our solar system by interacting with Jupiter, which is a big object, but we also have some idea that Jupiter-sized planets are not that common,” he says. Past research has found that only three to 10 per cent of star systems contain Jupiter-sized planets. But another large object that can easily eject something could be another star. Major questions about ’Oumuamua remain, notes Jackson. 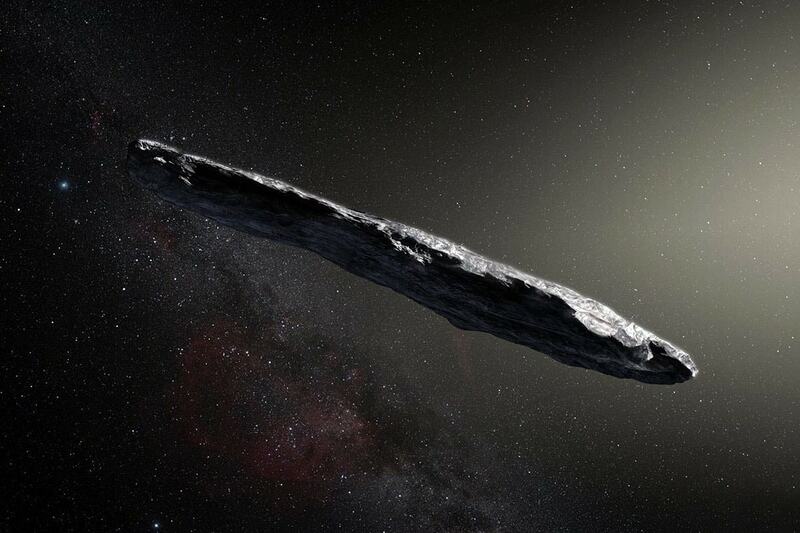 Researchers are trying to determine how it got its cigar-like shape and from where it may have originated. “It’s very difficult to track exactly where it came from with any great precision,” he says. For planetary scientists like Jackson, being able to observe objects like ’Oumuamua may yield important clues about how planet formation works in other star systems.